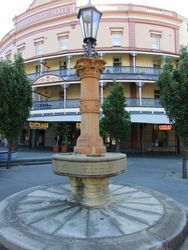 A fountain commemorates the jubilee of the Municipality of Glebe in 1909. 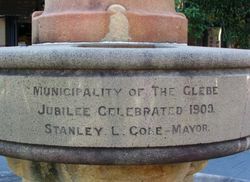 To commemorate the jubilee of the Glebe today the Mayor, aldermen, and residents of the municipality have decided to hold public celebrations today. 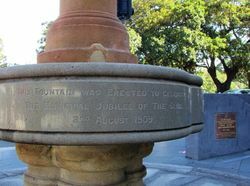 An artistic invitation card has been issued, on which are depicted the first unpretentious council-chambers and the present imposing Town Hall, as well as the Jubilee fountain and Jubilee Park. The programme will open with a reception of his Excellency the State Governor and Lady Chelmsford at the entrance to the municipality in Broadway, where an address of welcome will be presented to the Governor and a bouquet to Lady Chelmsford. A guard of honour from the Glebe and Forest Lodge cadets will be in attendance. The Jubilee fountain will be unveiled by the Governor, addresses will be delivered by the Mayor. Excerpt from Sydney Morning Herald (NSW), 2 August 1909. STANLEY L. COLE - MAYOR. G WIGRAM . 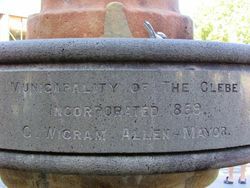 ALLEN - MAYOR.